Posted on February 11, 2019 at 10:17 am. B2B Customer Experience (CX) programmes are our bread and butter at Deep-Insight and we’re used to handling questions on how to make CX programmes more effective. Let’s deal with each question in turn. Let me preface this by saying that we are talking about business-to-business (B2B) relationships so there is an inherent assumption in the question that our clients have some existing – and hopefully strong – relationships with their clients and that the contacts in the client organisation will be receptive to a request to give feedback as part of that ongoing relationship. This is usually the case but clients – particularly senior clients – are busy people so it may not come as a surprise to hear that the average participation rate in a B2B customer assessment is around 35%. But that 35% figure is an aggregate score and there’s a little more to it than that, if you have a look at the graph below. 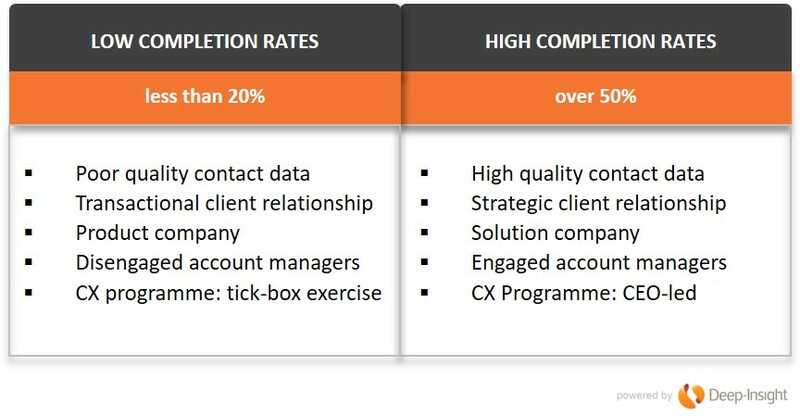 It turns out that the most of the CX programmes that we are involved in have completion rates in the 26-30% but we have a smaller number of clients – typically clients who have been running our Customer Relationship Quality (CRQ) assessments for many years – who regularly achieve completion rates of 50% and higher. If this is your first time running a customer assessment – either a simple Net Promoter Score survey of something a little more complex like our CRQ relationship assessments – you can expect completion rates of less than 1 in 3. This may sound OK if you regularly run consumer surveys where a 5% completion rate can be a good result, but for an existing long-standing B2B client relationship, it looks paltry. And yet we have been running customer assessments of all sorts for nearly 20 years and these are the actual numbers. The starting point is to understand why some B2B companies sometimes get low completion rates and others consistently exceed 50%. Our lowest-ever completion rate (4%) came from a first-time UK software company where the quality of contact data was simply terrible – people who had left their companies three years earlier, people who had never even heard of our client. That’s because the Account Managers did not personally sign off the client contact names. You get the picture. Our highest-ever completion rate cam from a company that has been a client of Deep-Insight’s for 10 years and whose customers view the annual CRQ assessment as an important part of their ongoing strategic relationship with our client. Make It Strategic. If the CX programme is CEO-led and driven from the top, it will not be seen as another box-ticking exercise. Make sure this is a key item on the Executive agenda. Put in Governance Structures. By this we mean things like: a) Account Directors should supervise and sign all contact names, not just pull them from the CRM system; b) the Sales Director should personally sign off all Strategic Client contact names. Don’t call it a Survey! At Deep-Insight, we ban the use of the term “survey” . For us, a CRQ assessment is a strategic ongoing conversation with the clients and their views will be taken seriously. “Warm Up” the Contacts. An invitation to complete a survey should not come out of the blue. Ideally, it should be introduced by letter or by email by the CEO or Country Manager, and while an assessment is “live”, the account manager will know to stay in touch with the client and urge them to complete the assessment. Close the Loop. This is critical. If you ask for feedback, you need to share that feedback with the client, agree the actions that BOTH PARTIES will take to improve the relationship. Repeat. Get into a rhythm where your clients and your sales/account teams know that every February or October (or whenever), the annual strategic assessment will take place. You may want to run frequent assessments. Some companies have quarterly Net Promoter or Pulse assessments – but don’t overdo the frequency. Your organisation needs time to put remedial actions into effect. If you are interested in reading more about running a CX programme effectively take a look at our process or contact us at sales@deep-insight.com. Posted on November 3, 2016 at 1:23 pm. 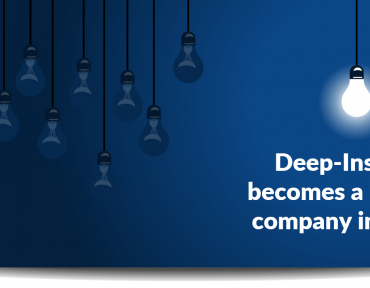 Deep-Insight works with clients spanning all industries – and our results show that it can be tougher to deliver services consistently well (and build strong relationships) in some industries than it is in others. One particularly tough industry is the provision of Outsourcing services. These services include IT, payroll, finance, manufacturing, call centres, washroom services… in fact, there are very few functions and processes that have not been outsourced. This phenomenon is not just confined to the private sector – some of the biggest outsourcing deals involve the provision of services to local, regional and central government clients. 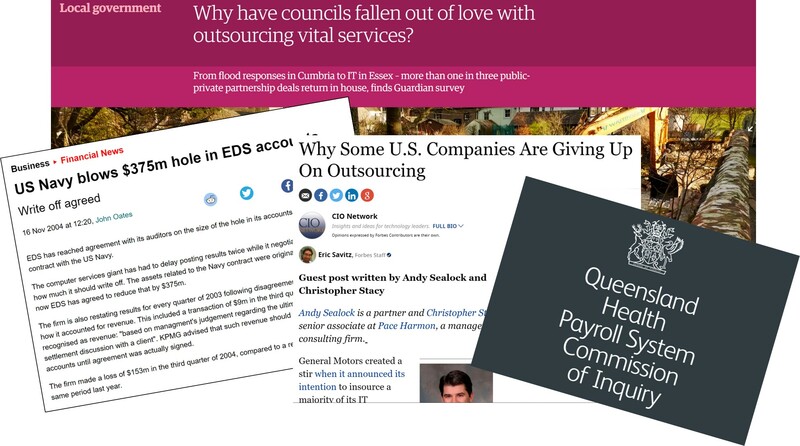 Over the past two decades, outsourcing has become commonplace as companies have focused on their core areas of expertise and hived off other functions to specialist organisations that can provide those services better, faster, cheaper than they can. Unfortunately, many of these arrangements fail to deliver the expected benefits, and many service providers get badly burnt when large contracts that they have bid for, and won, run out of control. Put it another way: they want to know what a ‘good’ CRQ or NPS score is for their industry. Many executives tell me that their industry is different. My stock response is that the nature of a business relationship is the same regardless of what industry you operate in. If the fundamentals of a business relationship are the same from one industry to the next, there should be little difference in CRQ or NPS scores across different industries. And yet, in practice, we do see significant differences in certain industries. 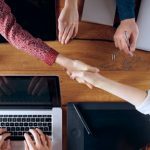 For example, corporate banks seem to find it easier to build strong relationships with their corporate clients than companies that provide complex outsourcing solutions. So why is this? Why does it appear to be so difficult for service providers to get really good customer feedback results and scores? And – back to the title of this blog – what is a ‘good’ Net Promoter Score if you operate in the Outsourcing industry? -The Efficiency Challenge. Outsourcing providers need economies of scale to make money. The unit cost of providing payroll services to 10 companies is lower than to a single company, but only if the service provider can establish a large efficient ‘factory’ for the delivery of these services. In most cases, the ‘factory’ managers operate on principles that are based on efficiency and cost containment rather than on delighting the customer. -The Offshoring Issue. As discussed above, service providers must run an outsourced operation at a lower cost that the company doing the outsourcing. One way of achieving that is offshoring – locating the ‘factory’ in another part of the world where labour costs are significantly lower. So the UK service provider moves the IT development to India, or the Australian service provider transfers the call centre functions to the Philippines. Nothing wrong with that, as long as it’s meticulously planned and executed. Often it’s not, and even when it is, there are always teething problems. SO WHAT’S A GOOD NPS SCORE FOR AN OUTSOURCING COMPANY? In a previous blog I said that an ‘average’ Net Promoter Score for a European B2B company is in the region of +10% and that scores in excess of +30% are truly excellent. Our experience is that an ‘average’ NPS score for Outsourcing companies is negative – typically in the region of -10% and that any NPS result in positive territory can regarded as a good result. So there you have it. 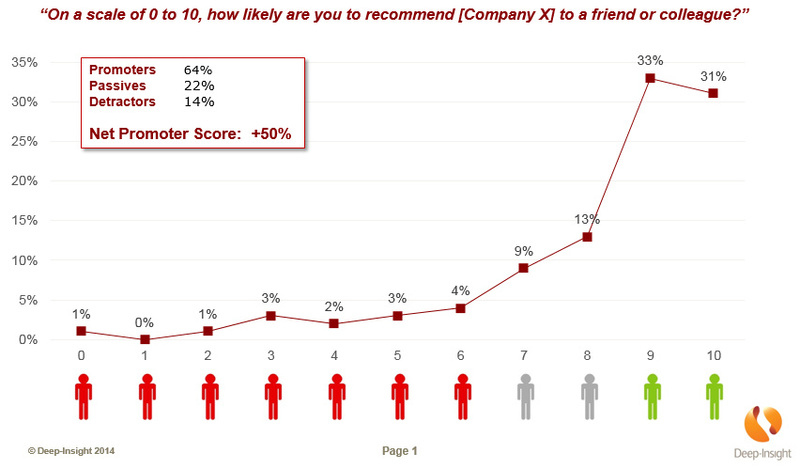 Zero CAN be a good Net Promoter Score for some European B2B companies. If you are a senior executive in a company that provides outsourcing services, you can settle for mediocrity and target your staff to achieve a zero or slightly positive NPS. Alternatively, you can work with your clients to make sure they avoid the 7 Deadly Sins (as well as making sure you avoid the Terrible Three internal sins), thereby outperforming the competition and making much greater profits for you and your shareholders. Posted on January 26, 2016 at 3:31 pm. If I got a penny for every time a client has asked “How do we compare against our competitors?” or “How are we doing against the benchmark for our industry?” I’d be a rich man. In fairness, some of our clients have latched on to the message that they should ignore the competition and focus purely on being indispensable to their customers, but it’s still tempting to see where you stand in a league tables against your industry peers. So let me ask a few questions about why you want to do benchmarking. -What exactly is your industry? Are you in the insurance industry, or the insurance broking industry? Or both? Or are you an outsourcing company that specialises in insurance third-party processing? These are all different industries, with different dynamics. And there are differences in average scores from one industry to the next. For example, we know from experience that IT and BPO outsourcing companies tend to get lower than average scores from their clients, while corporate or business banking companies tend to get slightly higher than average scores. Firms operating in niche markets sometimes find it easier to be seen as different and unique. -If I say you’re at the industry benchmark, will you really be happy? If you aspire to hit the average score for your industry, or your country, or the globe, you’re setting the bar pretty low. What you’re telling me is that you want to be an average company. To take my point to its extreme, benchmarking is little more than a recipe for mediocrity. 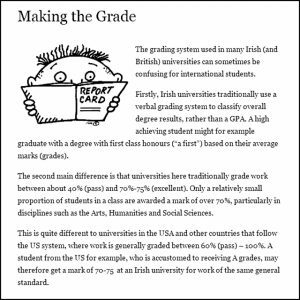 -Do you realise that international benchmarks are inherently flawed? This is not just because the insurance broking or widget-manufacturing markets in the Netherlands have a completely different structure than they do in Australia. It’s also because Dutch and Australian clients have completely different approaches to the way they answer customer surveys. There are some good academic papers on how different nationalities are pre-disposed to answering questionnaires differently. Let me give just one example. Some people will claim that the average Net Promoter Score (NPS) for B2B companies is between 25% and 30%, regardless of industry. However, these figures are heavily skewed towards US companies. Our experience of gathering NPS scores across 86 different countries since 2006 is that the average NPS score for any B2B industry is closer to 10%. But then again, our clients are more heavily weighted towards European and Australian respondents, who generally tend to score less positively than their American counterparts. Start by setting the bar higher. Aspire to be the best, or at the very least to be ‘Unique’ in the eyes of your customers. 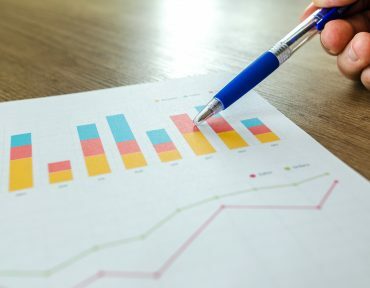 Our database at Deep-Insight shows that only 10% of B2B companies are considered Unique by their clients, but these Unique companies have significantly stronger relationships – and retention rates – than the ‘average’ company. Unique companies typically have twice the number of ‘Ambassadors’ and have NPS scores of 30% or more. Benchmark yourself against your own performance last year. That’s a much more reliable way of seeing if you are becoming more customer-centric or not. The journey to becoming a customer-centric organisation is a long one – don’t think you’re going to achieve it in anything less than three years – so be sure to check your progress formally on at least an annual basis.